Multimedia on webOS has always been a bit of a mixed bag. Some files play fine, others don't. Palm has given webOS users all the basic audio and video codecs to get by, but sometimes that's just not enough. Currently webOS supports the MP3, AAC, AAC+, eAAC+, AMR, QCELP, and WAV audio codecs and the MPEG-4, H.263, and H.264video codecs. Nothing more nothing less. However, that certainly leaves something left to be desired by many users. Zsoc from WebOS-Internals has heard your cries for wider format support. One of the first formats requested was GSM6.10 encoded WAV audio. Some businesses deliver voicemails via email in this format. And now, that coded request has been fulfilled. 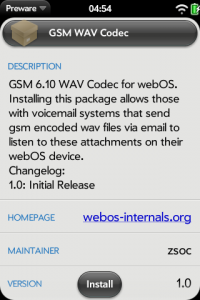 The GSM6.10 WAV codec is now available in Preware for your downloading pleasure. That's not all. Zsoc has managed to successfully add Ogg as well as Flac codecs onto his device however there are still a few issues that need to be ironed out before he works on figured out how to package it up for end users. In addition, he's made some headway at adding Xvid support, though there are still a few roadblocks to be faced. So if you've been waiting for GSM6.10 WAV for your device, today's your lucky day. It may not be official, but it's still top notch quality.